With 2017 mortgage pre approvals having now expired, the first wave of buyers facing OSFI’s ground breaking mortgage regulations are being put to the test. The regulations, also known as B-20, require all borrowers to pass a stress test at an interest rate 2% higher than the qualifying rate. Early symptoms appear rather obvious. National home sales slid for the month of March, falling 23% year over year, and pushing the average sales price down 10%. 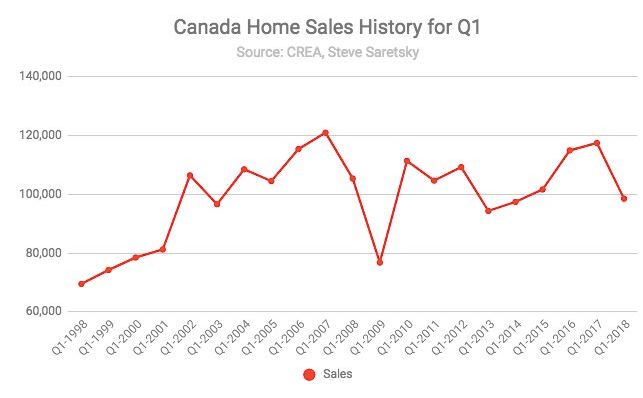 Overall, it was a bearish quarter for Canadian housing, first quarter sales slipped 16% year over year. 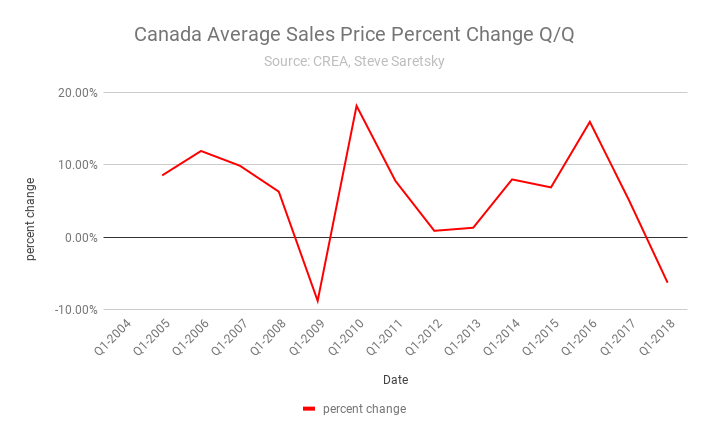 To little surprise this reflected in the national home prices across Canada. The Q1 2018 average sales price declined by 6.27% from Q1 2017. It was the first negative percentage decline since Q1 2009. The impact of the mortgage stress could become more apparent moving forward, particularly if borrowing rates continue to rise. As of today, a homebuyer hoping to purchase the typical home in Greater Vancouver (as per the MLS benchmark price of $1.084M) would require a minimum downpayment of $216,800 and a verified income of $175,000, assuming a 5 year mortgage at a generous 2.99%. Is it any wonder prices of one bedroom condos continue to rise. The median price in Greater Vancouver hit a record high of $540,000 in March.